Riktigt fin jigg från Lucky John! Indränkt i makrillsdoftmedel och flera riktigt fina färger! Fungerar fint till bl.a. dropshot, Texas- och Carolinarigg eller vanlig jiggskalle! 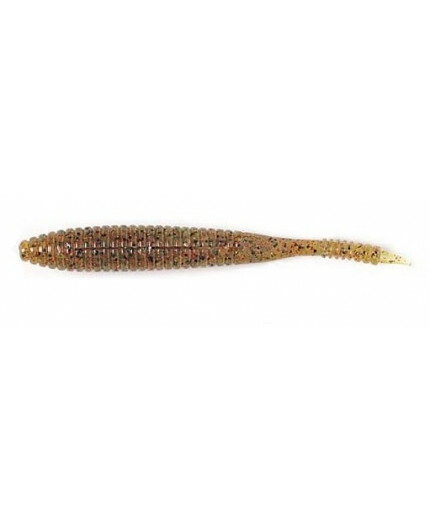 Finns i 2,8" och 3,8"
S-SHAD is a shad with an elongated ribbed body. Due to the original shape of the lure, its body has a different cross-section in its front and rear parts; such geometry of the lure’s body ensures its special play, attracting any predator. S-SHAD is made according to advanced technology. It is a lure from the so-called class of scented. The lure has explicit taste and scent of mackerel due to the aromatic salt introduced in the structure of the material and a special aromatic oil used as the coating of the lure. The lure is made of very soft silicon, which, along with aromatic and flavour properties, confuses the predator; it keeps holding the lure in its mouth, allowing you to make a confident strike. After fishing, it is recommended to put the lure back into its packaging, since it contains aromatic oil and the so-called “recharge” of the lure takes place. S-SHAD is a great solution for angling from early spring to late autumn.